Tim Effler has been in the creative development business for over 30 years. He spent an early part of his career as a designer at Mattel in Los Angeles and then, as Director of Product Concepts at Hasbro, he contributed to many of their most successful toy lines including Star Wars, Batman and the Jurassic Park. 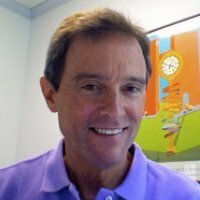 For 13 years, Tim was also a partner in his own company, SOEDA, Inc., a creative consulting company. Clients included Mattel, Fisher-Price, DreamWorks, Universal Studios, Fox Entertainment and Sony Pictures. His work on the Pirates of the Caribbean toy line won a TOTY (Toy of the Year) award in 2007. Tim moved to Atlanta in 2006 as V.P. of Concept Development at Digital Blue While at Digital Blue, he identified the potential of the LEGO license and developed a line of electronic products that won a LIMA Licensing Excellence Award in 2010. Tim joined Kids II in 2010 where he is currently the Principal Designer of the Infant Toy Group. Tim has a BS in industrial design from the University of Cincinnati and did post graduate study in Illustration at Art Center College of Design in Pasadena California.